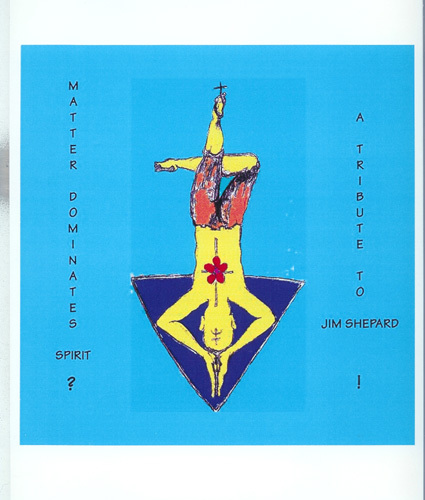 Matter Dominates Spirit- Jim Shepard Tribute comp. 2001 saw the release of a highly limited, hard-to-track-down double LP tribute album to the late, Jim Shepard. A lasting member of the art-rock movement with his band's Vertical Slit and V-3, Shepard also spent the '70s releasing self-constructed, lo-fi recordings. Tragically, in 1998, Jim Shepard took his own life in his home-town of Columbus, OH at the age of 44. In Pollard release world, he may have outdone himself with this one. Pollard joyously buries this come-and-find-me track on this friendly-affair tribute album to a friend and contributor. Yes, Jim Shepard contributed guitar and backing vocals to Pollard's fist solo LP Not In My Airforce. The double LP contained two hand-screened sleeves for each record, as well as hand-pasted cover art. Limited to 500 copies total, the double LP was released in 3 different variations (dark blue Disc 1, white-marble Disc 1, and both Discs black). Also featured on the limited release, appearances by Columbus, OH's Moviola, Musicol Recording engineer Chris Loper, and even features cuts from the vault from the late, great Shepard himself. Bristol Girl- 5 Pollard tackles the Shepard penned track, off V-3's 1996 LP Photograph Burns. Shepard's original is a stunningly beautiful, shoegaze tune complete with subtle swells and heartbreaking baritone melody. Here, Pollard delivers a brittle, lo-fi acoustic guitar version that's equally emotionally reflective, and just as flooring. Perfectly suited for Pollard to take the reins on this one. Emotions are heightened in the wake of Shepard's suicide 3 years prior to this release. Get a digital copy from bandcamp. This is another gem for your crown, now you can look the part of prom kings and queens.